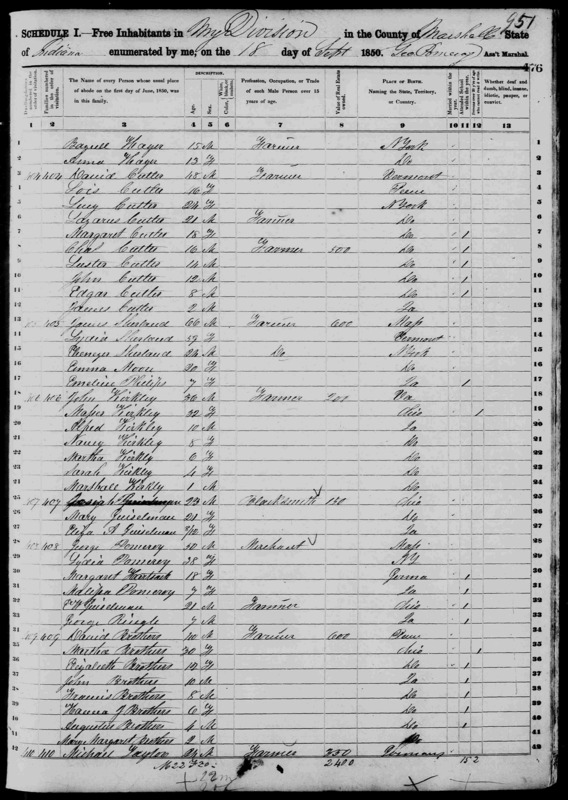 1850 census of Bremen, Indiana. This page shows the George Pomeroy and Josiah Geiselman (here spelled “Guiselman”) families who founded the town in 1846. Some sources suggest the town was founded by Pomeroy and Geiselman as “New Bremen” as early at 1836, but Josiah Geiselman would only have been 9 years old, and he married in Marshall county in 1849 at 22. Rather, there were some farms established in the area around 1836-37, notably the Laudemans. Next door to them is David Brothers, who became the town’s first postmaster and got the post office named “Brothersville” in 1847. George Pomeroy, who replaced Brothers as post master in 1848, quickly changed the post office name to “Bremen”.